UPDATE: WE STILL HAVE PLENTY OF SHIRTS AND FINISHER MEDALS. Welcome to the 6th Annual Joplin Turkey Trot 5K Run/Walk presented by Johnson, Vorhees and Martucci, Leggett and Platt and Habitat for Humanity, benefitting Circles Joplin in Downtown Joplin! Runners and walkers are encouraged to join us on Thanksgiving morning for what’s quickly becoming a family tradition for many. This CERTIFIED 5K course begins and ends right in front of Joplin City Hall on Main Street, which is closed to traffic. Participants of the 5K will enjoy a long sleeved race shirt, AMAZING FINISHER MEDAL, chip timing, start/finish line announcing by BoCa Enterprises, music by Resonation, Krispy Kreme donuts, and Ninja Narwhal coffee. Club 609, across from the finish line, will be open just for our runners who want to have a Bloody Mary or other mixed drink before heading to Thanksgiving dinner. 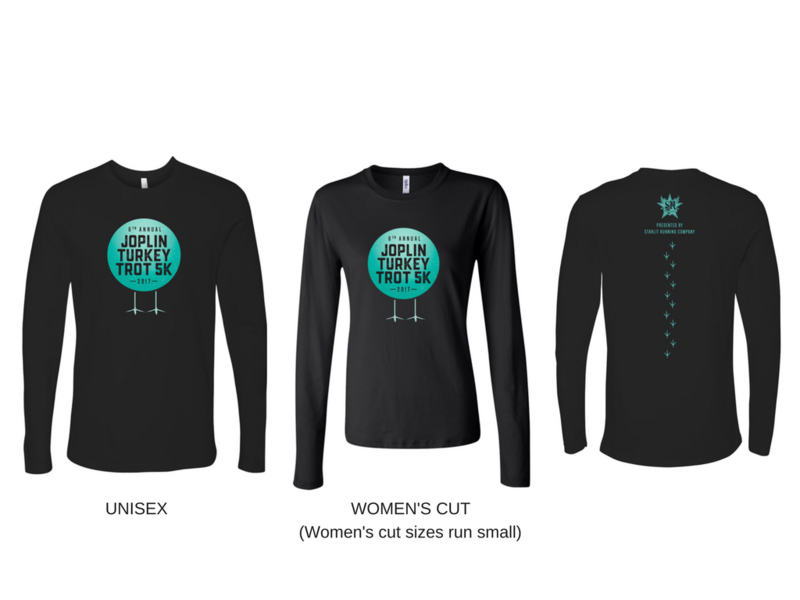 As Joplin’s largest 5K, this is a race you don’t want to miss! Circles Joplin helps people help themselves escape the cycle of poverty. No handouts are given. During the 2 year course, people support one another through friendship and fellowship to improve their incomes, educations, and relationships. Get involved or find out more at circlesofjoplin.org. Packet pick-up will be held at The Run Around (422 S Main) on Wednesday, November 22th from 10:00am-6:00pm. Late packet pick-up will be available on race day from 7:00 am - race start. 5K participants registered by November 13 will be guaranteed a soft cotton long sleeved race shirt. After November 13, shirts will be given on a first come, first serve basis. Those participating in the 1 Mile Fun Run have the option of adding a shirt to their registration for just $7 until Novemember 14. Runners will enjoy Krispy Kreme donuts and coffee. There will be professional DJ playing music and a professional race emcee keeping runners informed during the event. There will be a photographer on course capturing your finish. All photographs are free to download! Fun Run participants under the age of 12 will receive a finisher's medal. All Fun Run participants will enjoy post-race snacks and festivities. Fun Run registration does NOT include a shirt, but a shirt may be purchased in addition to the registration via the check-out process. 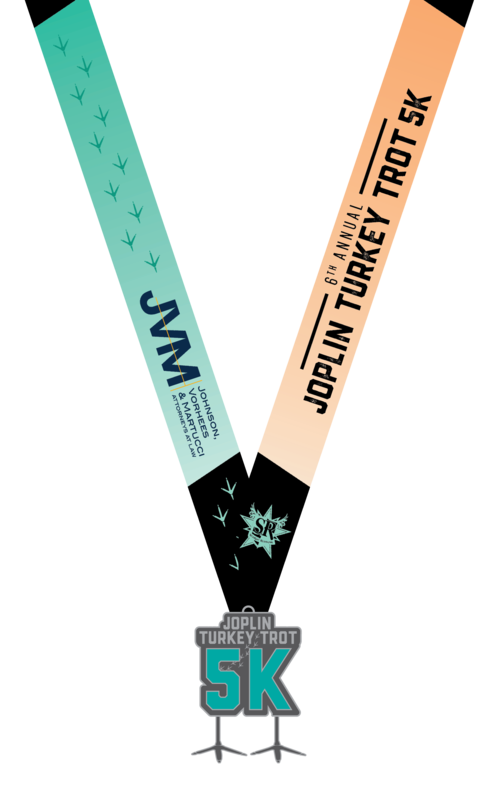 The Joplin Turkey Trot Corporate Challenge is a fun way to encourage health and wellness for your employees and their families, while supporting our benefiting charity: Circles Joplin. Joplin area businesses and organizations will compete in two divisions: (1) LARGE EMPLOYER DIVISION (100+ employees), and (2) SMALL EMPLOYER DIVISION (under 100 employees). Participating businesses/organizations get credit for their employee and employee's family participation. 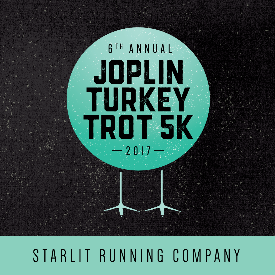 The 2017 Joplin Turkey Trot Corporate Challenge Champions will be presented trophies at the Turkey Trot. 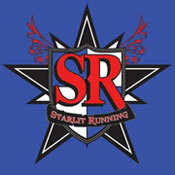 To enroll your organization, email Starlitrunningco@gmail.com with your organization name and number of employees. 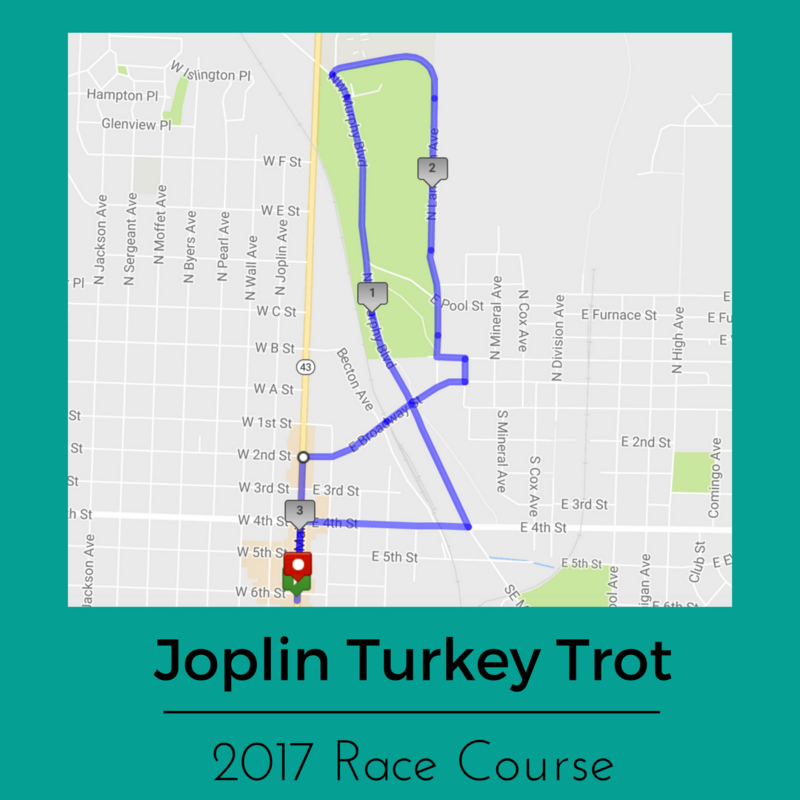 On or after race day (November 23th), post your time result on either the Turkey Trot Event page or on your My Activities dashboard on LocalRaces.com. Our staff will then mail the virtual race packet. 1. Are strollers allowed on course? Yes! Please feel free to take your little one/s along for the run. 2. Is this a pet friendly event? Absolutely! Well-behaved, leashed dogs are allowed on the race course. Main Street from 2nd to 7th will be closed to traffic. Parking is available on Joplin Avenue and Virginia Avenue. 4. Can I walk the race? Of course! This is a family oriented event with a great mix of walkers and runners. 5. Will the race be cancelled if the weather is bad? We will run rain or shine, wet or dry! Only in the event of severe weather including lightning will we postpone the start until the weather has passed.